Elizabeth Barlow Rogers and Theodore C. Rogers are the owners of the Browning Ranch. Ted Rogers is a former CEO of a major industrial corporation and the cofounder of American Industrial Partners, an investment firm specializing in the acquisition, management, and sale of basic manufacturing companies. The daughter of C. L. and Elizabeth Browning, the ranchs prior owners, Betsy Rogers has had a distinguished career as an author and historic landscape preservationist. She is the president of the Foundation for Landscape Studies and the author of several books including Landscape Design: A Cultural and Architectural History (New York: Harry N. Abrams, Inc., 2001). Ted and Betsy live in New York City. In 2001, Betsy and Ted were introduced to their Johnson City neighbor, J. David Bamberger, owner of the 5,500-acre Selah-Bamberger Ranch Preserve, and his wife Margaret, an environmental educator. Their visit to the Bamberger Ranch, a renowned model for environmental stewardship and habitat restoration, prompted them to consider the future of their own nearby property. While some might question why out-of-state ranch owners would want to embark upon a similar project, the Rogers decided to do so. To them, the reasons were clear. The Texas Hill Country is exceptionally beautiful. To own a property of great scenic value is a privilege. To preserve the natural landscape and promote biodiversity is a duty. To perpetuate a sense of place through conservation action is a way of enhancing ones personal identity. "Why not," they reasoned, "invest in a project with the objective of increasing our own connection with a special part of the American landscape?" As a new wave of recreational ranching sweeps over the Texas Hill Country and larger ranches are subdivided, the land is being stressed to an ever-increasing degree. Everywhere scenic values and natural systems are being compromised. 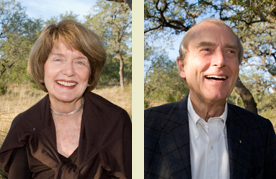 By hiring Scott Gardner, an environmental scientist, as ranch manager and by forming affiliations with academic and government institutions, Ted and Betsy hope that the Browning Ranch will provide useful data to help those who have come recently to the responsibility of recreational ranch management become fellow stewards of the land. This Web site is a means of sharing information about these programs and projects. It is also intended to provide a methodology for analyzing scientific information in a manner that provides a useful base of knowledge from which to build increasingly competent ways of stewarding landnot only in Texas, but elsewhere as well.